New parents face many questions about caring for their kids, and it’s no different when it comes to sun safety. Is it safe to put sunscreen on a baby? How young should you start getting your kids to put on their own sunscreen? We’ve put together a list of handy hints from the Cancer Society of New Zealand. Babies younger than 1 year old should be kept out of direct sunlight altogether. Never rely on sunscreen to keep your baby safe. Their skin isn’t thick like ours, so their skin can burn in just a couple of minutes and they can get sun damage from only a small amount of UV radiation. The Cancer Society especially recommends keeping infants out of the sun as much as possible from September to April between 10 am and 4 pm, as this is the highest Sun Protection Alert period. However, when you need to take your infant outside, you can apply a SPF30+ or higher broad spectrum sunscreen on any areas of skin not covered by clothing. Put it on at least 20 minutes before taking them outside and reapply it every two hours. Make sure that the sunscreen is water resistant if they are playing in water, and reapply if every hour or more to prevent the sunscreen getting washed off. As with any other skin products for your baby, stop using the sunscreen immediately if they come up in a rash or show other signs of skin irritation. Many brands have a gentler version specifically designed for babies or toddlers. Plan the day so you can spend as much time as possible in the shade or inside. Choose a shady play area. 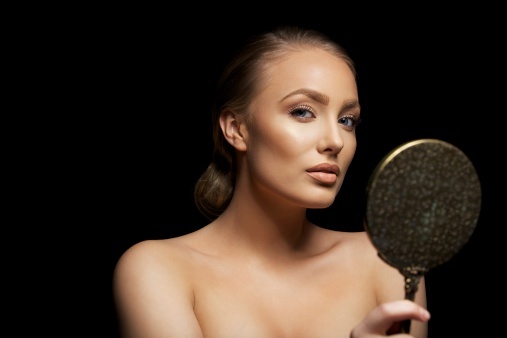 Cover as much of their skin as possible with loose-fitting clothes or wraps with opaque fabric, where there are no holes or transparent parts for the sun to sneak through. Put a broad-brimmed or legionnaire-style hat on that little head, so that their face, neck and ears are all protected. Watch that hat like a hawk. Not many kids like keeping a hat on their head. Put the pram or stroller in the shade or drape a cover over it, made from material that casts a dark shadow and protects the infant from UV light. Make sure that the cover material is not so shiny that the light actually reflects in on your child’s face. UV radiation cannot be felt, so you can’t imagine that because it’s a cold day, your child’s skin is safe. UV radiation can penetrate clouds and the shade of trees or shade cloths. It can also be reflected up off the ground, especially around water, sand, snow or concrete. 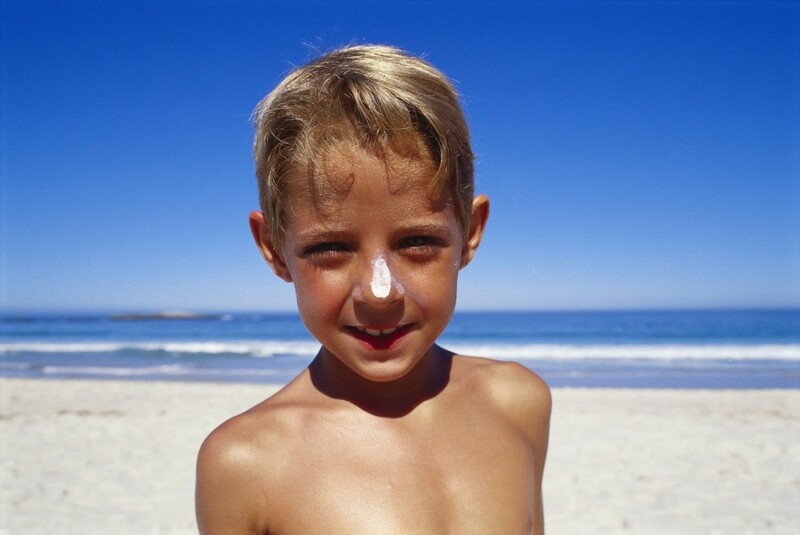 Can young children apply their own sunscreen? It depends on how old your child is and how responsible they are. Every child is different, after all. The Cancer Society suggests you supervise young children while they’re still learning to apply their own sunscreen. Other international Cancer Societies have recommended that children from 5 years and up should be encouraged to put on their own sunscreen while you supervise them. This is because kids need to learn this skill before they start attending school, where they will be expected to put it on for themselves every day for sports and other outdoor games. 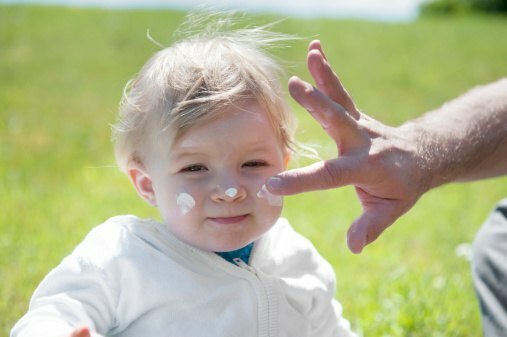 For further information, please read the NZ Cancer Society’s page Sun Protection for Babies and Toddlers.